With the inaugural launch of the super-powerful Falcon Heavy rocket now in the books, SpaceX CEO Elon Musk is ready to set his sights on an ambitious project known as Starlink. On Saturday, SpaceX will launch two experimental mini-satellites—the first batch of what Musk hopes will eventually comprise a 4,000-satellite constellation providing low-cost internet around the globe. Announced back in 2015, Starlink is designed to be a massive, space-based telecommunications network consisting of thousands of interlinked satellites and several geographically dispersed ground stations. CEO Elon Musk says SpaceX is “going to try and do for satellites what we’ve done for rockets.” The plan is to have a global internet service in place by the mid-2020s, and get a leg-up on potential competitors. Should all go according to plan, the revenue gleaned from the Starlink project could be used to fund eventual missions to Mars. Two prototypes, named Microsat 2a and 2b, are now packed and ready for launch atop a Falcon-9 v1.2 rocket. A memo from California’s Vandenberg Air Force Base confirmed the launch, which is scheduled for Saturday, February 17, at 6:17 a.m. PDT (9:17 a.m. EDT). In addition to these mini-sats, the Falcon 9 will deliver a 3,000-pound radar observation satellite called Paz for the Spanish government. Not much is known about Starlink and the test satellites as SpaceX has been tight-lipped about the whole thing, and for good reason. The company faces tough competition from rivals OneWeb, Samsung, Boeing, and Telesat. Both OneWeb (which boasts such partners as Jeff Bezos’ Blue Origin and Richard Branson’s Virgin Orbit) and Samsung have plans to create similar communications constellations using satellites in low-Earth orbit. But thanks to a publically available government application, some details about the test satellites are known. The twin microsats measure 43 inches by 28 inches by 28 inches (1.1 m x 0.7 m x 0.7 m), weigh 880 pounds (400 kg) each, and are powered by a pair of 26-foot long (8 m) solar panels. Once at an altitude of 700 miles (1,125 km), SpaceX will test the satellite’s various systems, including its phased array broadband antenna. The company says it will conduct tests of the Ku-band (12-14 GHz) radio communication system about once every 0.9 days for durations lasting less than 15 minutes. Ground stations have been situated in Washington state, California, and Texas. SpaceX will also be testing satellite communications on mobile vans equipped with receiving terminals. 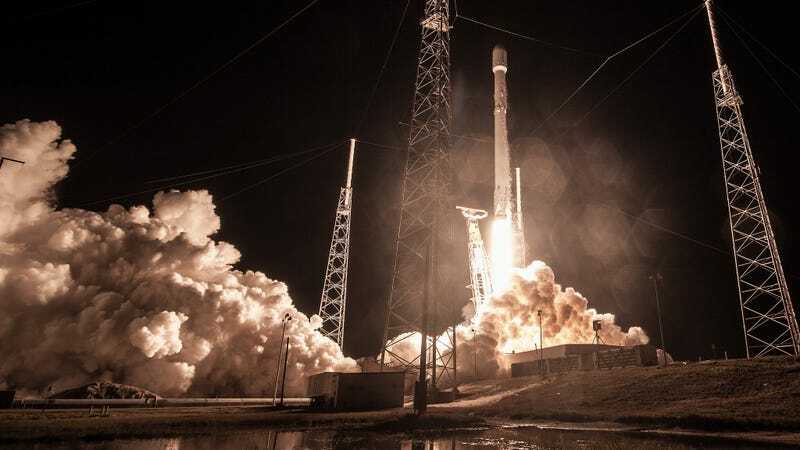 News of Saturday’s SpaceX launch comes a few weeks after a Federal Communications Commission report revealing the number of Americans without access to both fixed and mobile broadband at around 34.5 million (as of 2014). Via the National Broadband Plan, the U.S. government is currently trying to bring high-speed internet to places where service is lacking, especially rural areas. And as if on queue, the FCC just endorsed a SpaceX application to provide broadband services to the U.S. and worldwide using low-orbit satellites. Similar applications by OneWeb, Space Norway, and Telesat for the U.S. market have already been approved by the FCC, reports Reuters. That being the case, and seeing as the FCC has approved Saturday’s launch, it should only be a matter of time before the rocket company—and now satellite company—gets the green light as well. As per usual, you can watch Saturday’s launch at SpaceX’s webcast page.